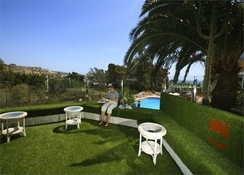 Corona Roja Apartments is a 2-star property offering basic amenities and comfortable accommodation in Playa del Ingles. Looking over the majestic Atlantic Ocean, this beach is thronged by tourists throughout the year. Located at a distance of 2km from the Maspalomas Dunes; gigantic sand dunes in the southern coast of the island of Gran Canaria where guests can book camel rides and enjoy a surreal experience. With affordable rooms and close proximity to the nearby shops and eateries, Corona Roja Apartments offer an ideal venue for business guests and leisure travelers both. Tourists can avail all-inclusive packages here if they do not want the hassles of clearing the bills later on. 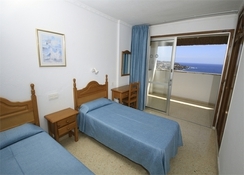 Corona Roja Apartments is at a 5-minutes' walk from the popular El Veril Beach. 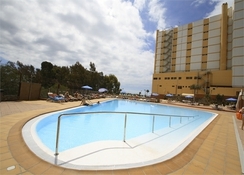 The Gran Canaria Airport is about 33km from the hotel. The famous destination of San Fernando can be reached in just 15 minutes by foot. The rooms here are simple studio rooms featuring kitchenettes, living areas, televisions with satellite connectivity and free Wi-Fi at a surcharge. 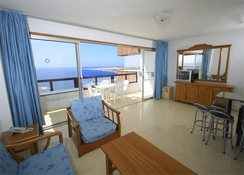 All the rooms also offer balcony views and some of them overlook the ocean. The apartments offer separate living rooms with sofa sets. Guests can avail room service if they wish to eat from the comfort of their rooms. Tastefully done interiors in subtle shades of white and grey make the rooms very appealing and soothing. The rooms are cleaned every day. The bathrooms are equally well-maintained and comfortable. The hotel serves complimentary breakfast every morning. For your other meals, you can sample the delicious international fare at the on-site restaurant. Two swanky bars serve heady drinks and the choicest spirits in town. Guests can access the various beaches, bars and cafes in the town of Playas del Ingles at a distance of 300 meters from the property. 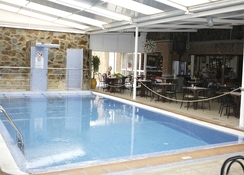 The indoor and outdoor pools here provide plenty of fun and rejuvenation. A tennis court here enables you to polish your tennis skills. Your children would keep themselves entertained at the vibrant playground here. 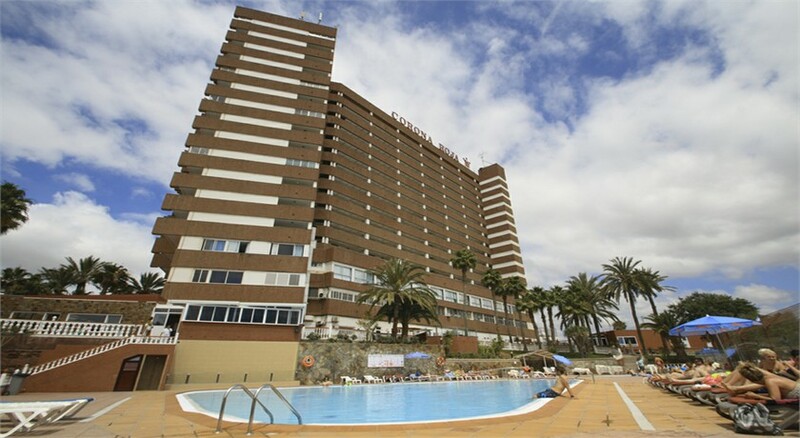 Corona Roja Apartments offer plenty of recreational facilities to the tourists. Guests can also hire bikes to explore the nearby areas. The property has a spa which offers some healing treatments and massages. One can get some pampering massages done here and feel completely relaxed and rejuvenated. I've stayed here a couple of times, all inclusive. The first time the room was small and had no balcony. But it did the job. The second time, the room was huge and very spacious, with a balcony. Both times it has been clean and the staff have been attentive. The food was yummy with variety, it seemed fresh, there was fruit available- and they catered for my vegetarian friend when we asked. The only thing that let it down were the puddings, but I could deal with that. There's a shop onsight which wasn't bad value for money and a 24 hour reception. The area is beautiful, really beautiful. The beach and the dunes... Wow. And there is nightlife through until 6am for those that want it. With a variety of different bars/with different music etc. Shopping was also really good. We stayed at the corona in sept 18. We thought it was a lovely hotel, very clean, the restaurant was nice with views over the pool and there was a good variety of food every day, our only complaint was they only had bacon for breakfast on the Sunday. The beach was only a 2 minute walk away. We stayed on the 13th floor so we had brilliant views of the sea from our balcony. The staff were friendly and like I said earlier they were always cleaning ect. We would go again. This hotel is a little dated, but is clean, comfortable and very good value for money. The rooms are basic, but functional. Staff are friendly and wifi is free. Pool area is clean and pleasant and dining room bar simple. There is nothing wrong with any of it and one could not really expect more for the price. If you want luxury, pay for it. If you want a decent, comfy place to sleep and prefer to enjoy your money out and about, then this is the one. Not a bad place at all , we stayed for a week all inc.